To add a new monitor, select the File - Add Monitor main menu item, or click the corresponding toolbar button, or right-click the monitor list. Then select the desired monitor type from the pop-up menu. The editor dialog will appear. 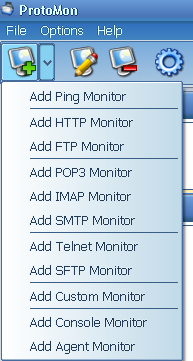 Read the child topics to learn how to configure the common monitor properties. Then see the Monitor Types section to learn about the specific properties. With this server monitoring software you can add unlimited number of monitors. Also you can import monitors from any text file.